(Alli) Growing up as a competitive swimmer in southern California, I’ve been on swim “teams” my entire life. For cross training, I ran cross country; also, a “team.” Unlike other team sports, the structure of a swim team and a cross country team relies on the independent and competitive nature of the individual to push themselves and their teammate(s) to a higher level. To my parents, one a collegiate volleyball player and the other your typical all-around athlete, these were not team sports. On the road to Lajitas! Couldn’t resist taking a selfie in front of a beautiful mountain landscape!! But what would happen if you took two kindred spirits, successful in their own right, and told them that if they can work together, the world is theirs for the taking? 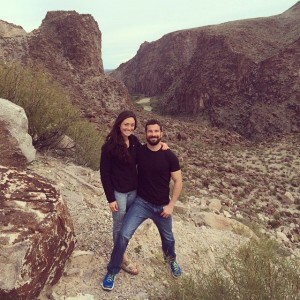 Last August, prior to officially committing to my first 50-mile ultra-marathon, I reached out to Darren for his advice as an experienced endurance runner and fellow marathon swimmer. “Do you think this is possible?” I asked. “Absolutely,” he said. And our team was formed. COMMUNICATION. 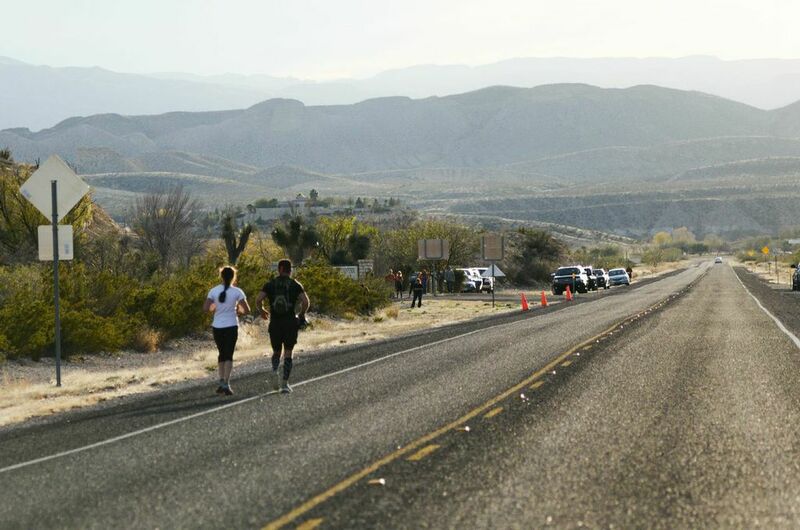 (Darren) We culminated an incredible few days in far west Texas with the Big Bend 50 – an ultra-marathon in Big Bend State Park right along the Texas/Mexican border. As we blogged last week, Alli was running this race to honor a friend in the fight against cancer, and I was simply there to support her mission and be beside her every step of the way for our first adventure together. This being my first experience in the Lone Star State I wanted to make sure it was memorable! Flying into El Paso from San Diego (speaking engagement in Newport Beach the week prior) I rented a Jeep, and drove the 180-miles east, and south to Marfa. Alli is currently on a one-year term with the Judd Foundation (www.juddfoundation.org/visit_marfa) as a Registrar, and will be completing her term in May. From my perspective, Marfa is without a doubt in the middle of nowhere. It was amazing to have a speed limit of 80-mph through Texas, yet felt like I was walking along due to such a ‘wide open spaces’ feeling driving down a perfectly straight highway, mile after mile. I was passing ranches left and right, hitting tumbleweed and intrigued by amount of Border Patrol vehicles. I enjoyed every moment in such a remote, but incredibly beautiful, location. We ate dinner Friday night at Cochineal (cochinealmarfa.com) and feasted on sunfish, and a pork dish – both were incredible! A fine bottle of merlot, two cocktails, blueberry pie and a molten chocolate cake later (yes, we are Channel swimmers, remember…), we hit the streets and spent some time walking and exploring a few local establishments before retiring for the evening. We took a 30-minute morning drive to the town of Alpine where Alli’s grandmother graduated from Alpine High School, class of ’46. It is also home to Sul Ross State University, a great diner named ‘Bread and Breakfast’, and most important to me, the closest laundromat! While my clothes were washing, we took a 3-mile run around the town and visited her friends who run the local Crossfit gym (www.bighillcrossfit.com) continued past the high school and finished strong at PLAINE, the coffee shop serving Big Bend Coffee Roasters (bigbendcoffee.com) for a cup o’ Joe. 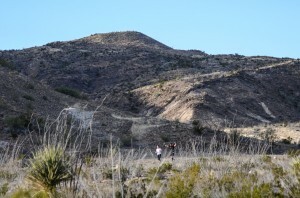 We returned to Marfa, collected a few things and hit route 67 south through Presidio, then route 170 along the Rio Grande to the Lajitas Golf Resort & Spa (www.lajitasgolfresort.com) for the 50-mile race registration. We ate dinner (fajitas in Lajitas!) then continued further down the road to Study-Butte, only to have to turn around, as we passed the ghost town (hence missing it) of Terlingua, to stay the night at the fabulous* El Dorado Hotel (www.eldorado-hotel.net). We packed our drop bags for the 24-mile marker, taped up (www.rocktape.com) Alli’s knee and back (thank you, Mandy!) and settled in for a few hours rest before the start of the race at 5:35AM. We awoke to the sound of both cell phone alarms, ate PB&J sandwiches, apples and a Monster Java (couldn’t find coffee the night before) to get some caffeine flowing through the system. We packed our gear, I took a quick (cold) shower and headed out the door. We picked up Alli’s friends, Jeff and Sarah, en route to the car, as Jeff was running the 50-mile race as well, whereas Sarah was there to interview Alli and document the journey for the local newspaper. (Alli) 5:30am on Sunday morning. Darren had that look in his eye, “I know something you don’t know…” and reached over to give me a quick kiss before we began running into the night. COMPASSION. (Darren) The start of an ultra is typically a very exciting time. People are milling around, stretching, laughing (about how ‘crazy this is’) eating, drinking and doing their best to maintain a positive spirit before heading out for quite a long run. We grabbed our drop bags (which are bags we have waiting for us at a predetermined spot, where we can stash anything we might need for the second half, or to change shoes, socks, etc.) and tossed them with the rest, while we slowly all gathered toward the starting line. The start took a few minutes to get underway, as we were read a short list of rules, comments and even had a brief moment of silence for the dead jackrabbit near the start of the trail (hey, whatever it takes) before we lined up underneath the yellow, starting line inflatable. 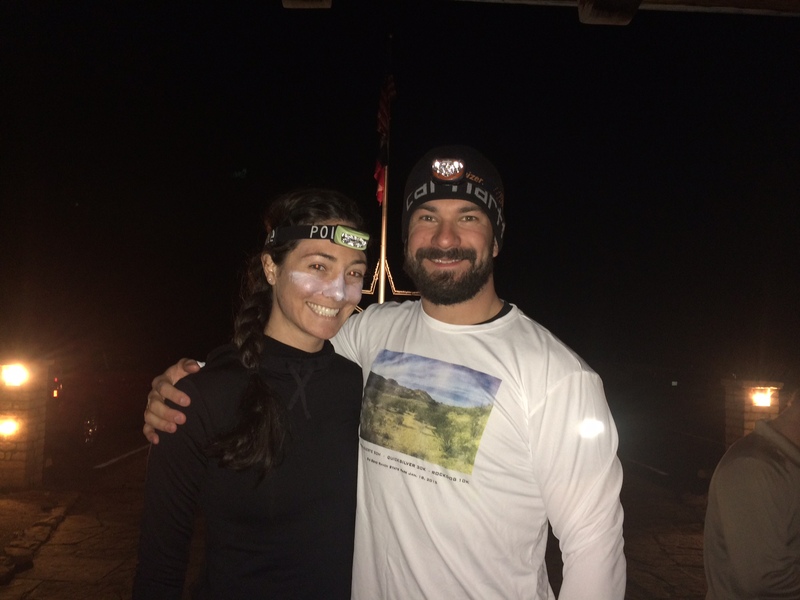 We held hands, said a few prayers for safety then headed out into the cold night air with our headlamps guiding the way! Morning of the race! 5:30AM, ready to roll!! (Alli) The pack of fifty quickly separated, but Darren stayed by my side. “But the view here is more beautiful,” he replied. HUMILITY. With a knee injury that prohibited me from training as I would’ve liked, my longest run going into the race was somewhere between 16 and 18 miles, one third of the total we were attempting. Having studied the elevation chart, we both also knew the first twenty miles would be climbing. PATIENCE. (Darren) There were about 50 runners in the race, and for the first 5-10 miles, we all stayed close proximity to each other. It was fun running single-back (narrow, one-person) trails in a pack, in the early, very dark, morning hours. Occasional conversations pierced the silent air, as with every breath, reflecting in a cloud of white steam against the pitch-black night. Our main focus in the first portion of the run was to maintain a solid, yet relaxing pace, and not to get too excited – there were plenty of miles left. I carried a pack, and stored a few essentials (knee/foot braces, extra water, gels and nutritional supplements), which then got stuffed with our cold weather gear, hats and gloves, before dropping some of it at the 24-mile market. I also ran with a water bottle in each hand that we would refill at each aid station with water, or HEED (www.hammernutrition.com) product to refuel with fresh electrolytes. The aid stations were strategically placed about 5-7 miles apart throughout the day, and allowed the runner to refuel on a consistent basis. Chips, pretzels, apples/oranges, salted potatoes, PB&J, M&Ms and drinks were commonplace, and were there to get the calories in the system. One thing about endurance exercise is the need to replenish the calories the body burns – that simply cannot be done by only eating ‘healthy’ food. As the sun began to break the morning chill, the trail began to wind upwards through canyons, river beds, single-backs and several mountainous ascents. The dry, spacious, mountain landscape was simply beautiful. I have a hard time imagining a more incredible setting for an epic (also the name of one of the trails) trail race! Running through the mountains in Big Bend State Park! (Alli) The goal was to get to the halfway point and still be feeling strong. But it was a race. And we were jogging. TRUST. (Alli) Around mile 30, we were told that the next station would have hamburgers and chicken fried steak. While my nose stayed alert for a BBQ, I could barely stomach a boiled potato wedge and told Darren I could go for a new leg. But upon getting there, not only was there no BBQ, but an unmanned water station. A SENSE OF HUMOR. (Darren) Although generally a decline, there were intermittent inclines during the latter 20-miles, however it was nice to not have to be completely ascending at that point! (Alli) Then, at what should’ve been the mile-40 aid station, we were informed it was mile 37. It seemed a theme for the day: no one had the same information. I felt myself begin to mentally breakdown. Darren took the lead and started singing the ‘Battle Hymn of the Republic’ to which I followed in stride. RESPECT. 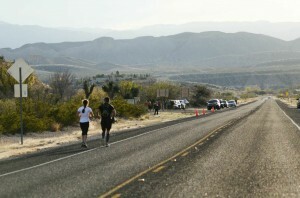 (Darren) The final few miles were a mix of rough road, which finally made its way to the final mile of single-backs. We jogged out onto the road the final 500-yards, and went back under the yellow starting inflatable to the sounds of many supportive spectators, family and friends who had gathered at the finish for support. 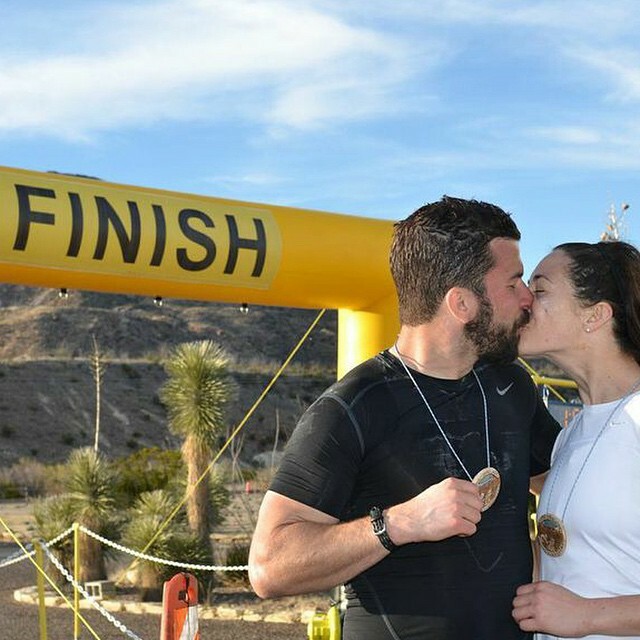 (Alli) And as we kissed while crossing the finish line just after 5pm, the cameras came out. It wasn’t about the race, but the wonderful adventure we’d just had together. TEAMWORK. (Darren) Throughout the 51.7-miles of painful bliss, we not only learned more about ourselves individually, but more importantly, how we respond to each other and that we worked as a team to get through a significant challenge in our lives. 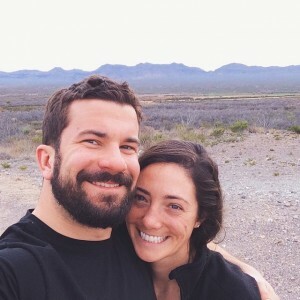 The most vital characteristics of our relationship are highlighted throughout the blog via Alli’s commentary, because they are essential components not only endurance athletics, but in life in general. While we are all guilty of allowing weakness into our lives at times, we should ultimately be striving to be the strongest we can for ourselves, and for our significant other. The trail threw a lot at us that day, but we survived. Alli was a warrior in every sense of the word throughout her first ultra-marathon. I could not be more proud, and honored to run by her side as we experienced the highs and lows together. We are here to live an example as to what is possible, building our brand and showing that love and respect for one another is the strongest bond you can have. Love your life and remember to smile through the pain. It is not always easy. It is going to be painful at times. But when you learn to work together through the darkness, you will eventually find the light.